The National Socialist German Workers’ Party, better known as Nazi Party, was founded in 1919 and shaped the far-right wing’s racist theories that had been winning followers in Germany and other European countries with special vigour since the last decades of the 19th century. The fundamentals of its ideology were its opposition to Communism and democracy and hatred to the Jews, as well as its defence of social Darwinism and the alleged superiority of the ‘Aryan’ race, that, in its opinion, was to rule the world. 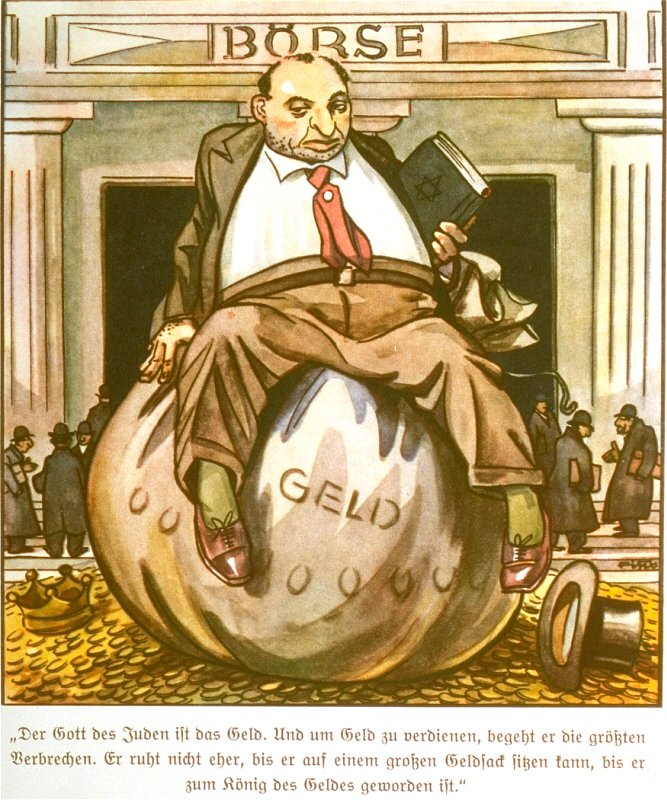 Many German shared the paranoid belief that the Jewish people were conspiring behind their back to control the international economic order. For them, the Semite was the enemy and must be annihilated. Left: Courtesy of The International Museum of World War II. Right: © Wiener Library. At the beginning of the 1930’s, the climate in German was critical. The Crash of 1929 and the resulting world economic depression had crippled the country and plunged its population in poverty and unemployment rates that were difficult to sustain. This, added to the humiliating German defeat in World War I and the punishment imposed in the Treaty of Versailles, created the circumstances that allowed the Nazi Party to win the elections. 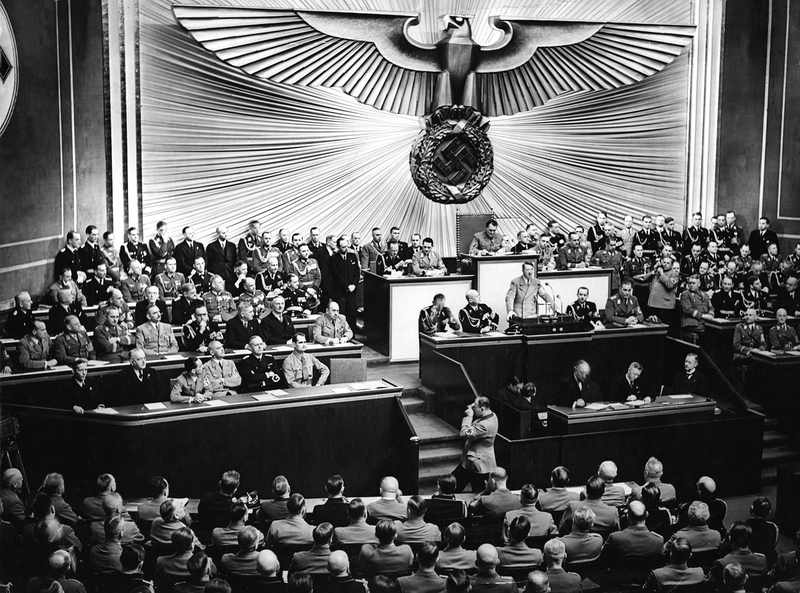 Its leader, Adolf Hitler, did not hesitate to present himself before his electorate as the saviour of the German nation’s destiny. Adolf Hitler owed great part of his success to his using of a simple, populist and direct language and a careful and overwhelming staging. His audience really went mad when he spoke. © German Bundesarchiv. Tens of thousands of followers supported him with their votes, believing in his promise to restore the former greatness of Germany and his accusation that certain minorities, and particularly the Jews, were responsible for the nation’s misfortunes. This is how anti-Semitism became institutionalized and the rights of a vast portion of the population began to be severed. 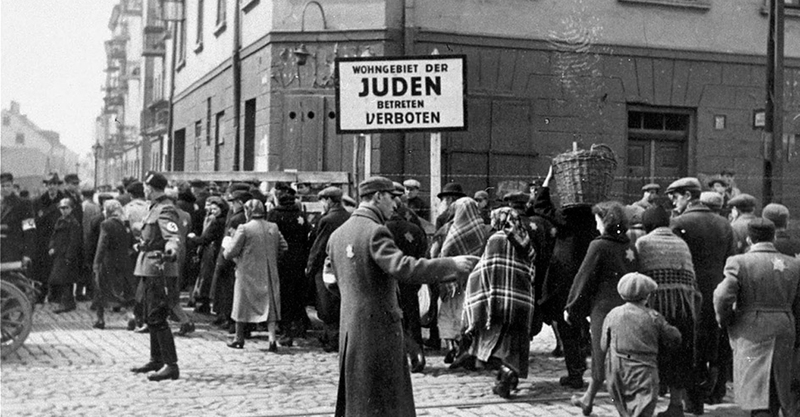 The authorities organized Anti-Semitic boycotts and book burnings, and enacted anti-Jewish laws conceived to make a portion of the German citizenship poorer and poorer, and more and more segregated. 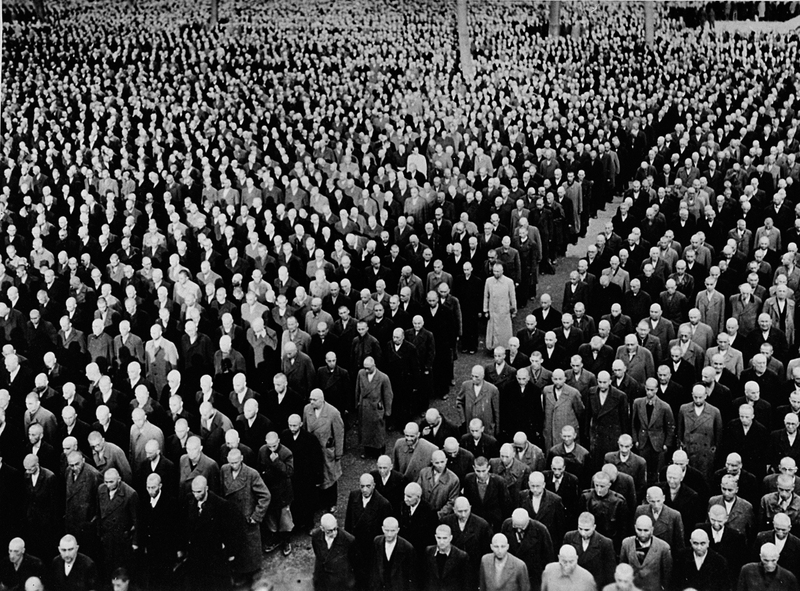 More than 30,000 Jews were arrested after the ‘Night of the Broken Glass’ (November 9, 1938). In barely two days, the aggressors murdered tens of people and destroyed more than 250 synagogues and 7,000 Jewish businesses… while the police sat on the fence. © Universal History Archive/Getty Images. 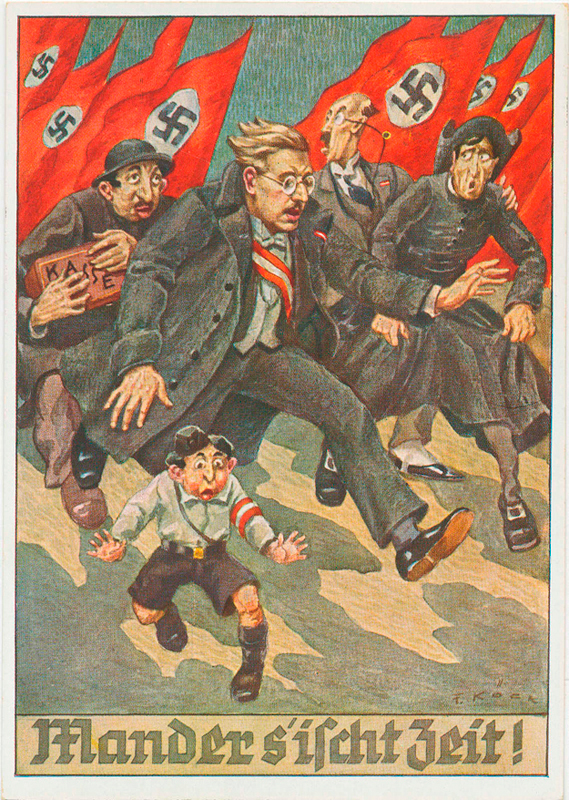 Ultimately, and after an escalation of anti-Semitic violence, this hatred would lead to the state-sponsored systematic murder of more than six million people deemed ‘enemies’ of the German nation–Jews, Slavs, Roma and other groups such as homosexuals, Soviet prisoners of war, disabled or, among others, Jehovah’s Witnesses. Over 30.000 jews were seized after Kristallnach (Crystal Night or Night of Broken Glass), on November 9th 1938. Dozens were killed, and more than 250 synagogues and 7000 jewish businesses were destroyed… While german police turned aside. © YIVO Institute for Jewish Research. «Anti-Semitism is exactly the same as delousing. Getting rid of lice is not a question of ideology, it is a matter of cleanliness”.